Evolution is an ancient pagan religion that was plagiarized, tweaked, dressed up and popularized by Charles Darwin. People like to call it "science", but it is the pseudoscience of an anti-God religion. It seems that some religious people wish to appear intelligent in the eyes of the world, so they accept evolutionary thinking, but they need to have some sort of veneer of religion, perhaps a "fire escape". So they tack God's name onto it so they can have the best of both worlds. Old earth compromisers will add to God's written Word, finding excuses to insert millions or billions of years where it is unjustified (Prov. 30.6, 1 Cor. 4.6). 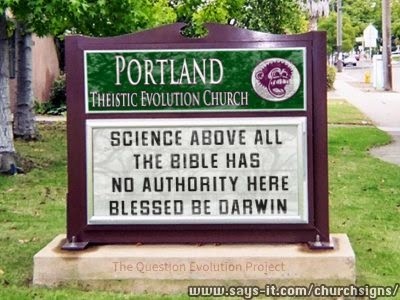 Theistic evolutionists take this even further, but both have a low view of Scripture. A great deal of modern theology is man-centered, not God-centered. Read the popular religion books, watch the television broadcasts, listen to radio sermons and religious music, and you'll hear about how God wants you to be happy and successful. Let's face it, a great deal of the Reverend Doctor Feelgood's messages are borderline or even outright heresy. Much modern theology accommodates evolution and long-age compromises. Various old earth compromises are rampant, but theistic evolution (TE) goes much further. Like Darwin did for evolution, theistic evolution takes the old Pelagian heresy and makes it presentable to modern audiences. It is man-centered and actually negates the need for the cross of Christ! TE organizations like Biologos strive to remove Adam and original sin, and replace them with evolutionism. Indeed, there are some TE bloggers that are so vicious, they claim to be Christian but actively misrepresent and ridicule biblical creationists, and join in with atheists in their mockery. I guess verses like Ephesians 4.12-15, 1 John 3.10-12, John 13.35 are not in their Bibles. In fact, I have doubts that they are actually Christians (Matthew 7.15-20). Christians are to seek to glorify God, not give precedence to their own pet doctrines or seek their own pleasures . Note that some people take an old earth or TE view simply because they have not thought the issues through, and are unaware that they are not only ignorant of science against evolution and an old earth, but unaware that they are doing violence to Scripture. Theistic evolution goes beyond the Pelagian heresy and actually supports atheism. The secular philosopher George Santayana wrote, “Those who cannot remember the past are condemned to repeat it.”1 King Solomon, the wisest person in all history said, “What has been is what will be, and what has been done is what will be done, and there is nothing new under the sun. Is there a thing of which it is said, ‘See, this is new’?” (Ecclesiastes 1: 9–10). This is especially applicable to Church history. There is no new heresy under the sun, and those who aren’t familiar with the battle for truth throughout the past 2000 years are doomed to repeat the same errors that have plagued the church since it began. Today we Christians find ourselves at an interesting place in Church history. Although Scripture has been with us for 2,000 years (and is sufficient for determining how and when God created), we now have decades of research that supports what the Bible has always said. Today we are blessed with mountains of scientific evidence supporting the biblical record of a recent creation followed by a global flood and all humans originating with Adam and Eve. Despite all of this, aspects of an old heresy relating to the creation account are increasingly infiltrating the Church. This is the falsehood known as Pelagianism. Please read the rest of this article by clicking on "BioLogos, theistic evolution and the Pelagian heresy: Debating an historical Adam and the destruction of the Gospel". Godly Prophesy or Sinister Forces?